Where to eat: Either eat at Mandya city or on the highway. Where to stay: Either stay in Mandya, SriRangapatna or Mysore. Melkote is located in Pandavapura taluk around 35 km from Mandya city, which is the headquaters of Mandya district and Mandya is 90 km from Bangalore. It is almost in between Mysore and Bangalore on Bangalore – Mysore highway. Here land is formed from some of the oldest Earth’s crust and is also know as Tirunarayanapuram. It is said that vaishnava saint Sri Ramanujacharya stayed here for long time and made it as prominent center of culture and education. The Hoysala king Vishnuvardhana became a follower of Sri Ramanujacharya. 1. Cheluvanarayana Swamy Temple: Here the presiding deity is Lord Cheluva-Narayana Swamy or Tirunarayana or Lord Krishna. In one of the annual report of Mysore Archeaelogical Department, it stated that people used to worship here even before Sri Ramanujacharya renovated this temple and offered prayer. From the records of that period there seems to Tamil influence and vaishnava worship in this area. Tamil influence one may argue from the name “Tirunarayanapuram”. The word “Thiru” is typically used in Tamil language. The Wodeyar kings of Mysore were special patrons of this temple and has bestowed special offers and protection. Raja Wodeyar in 1614 adopted vaishnava religion and offered a gold crown set with precious jewels known aas Raja mundi. Krishnaraja Wodeyar III also present one such crown known as Krishnaraja mundi. There is another crown — Vairamudi or Vajramukuta, which seems to be older than the other two crowns but no one knows where from it came. The annual festival of this temple is known as vairamudi festival and it draws lakshs of people. 2. Yoga-Narasimha Swamy Temple: On the hill nearby is the temple of Yoga Narasimha. 3. Library & Sanskrit College: There is a library maintained by Yatiraja Swamigalu of Melkote which has many works in sanskrit and other languages. The sanskrit college around 1853 known as Sri Veda Vedantha Bodhini Sanskrit Mahapathashala is a reknowned centre of learning vedic knowledge. 4. 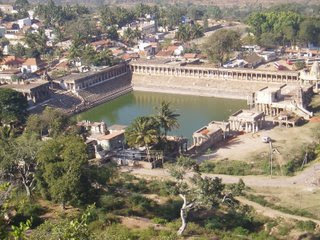 Kalyani or Pushkarani: The temple has a large pond known as kalyani teertham or pushkarani. The stones banked steps and structures around are beautiful and it has featured on many movies. 5. Melkote Temple Wildlife Sanctuary: Just 5 km away from Melkote town is the Melkote Temple Wildlife Sanctuary. The temple sanctuary was put in place in 1974 mainly to protect the wolfs. It has two parts Mudibetta and Narayandurga. Mainly short dry plants feature this area along with other wildlife like — spotted deer, bonnet macaque, leopard, jungle cat,black buck, wild pig, langur, Indian fox etc. One can also spot numerous birds and even peacock at times. 6. Thondanur Lake: Thondanur Lake is situated around 25 km from Melkote on Pandavapura road. It is said that water never dried up here. The water is so clear here, that Tippu Sultan called it Moti Talab (pearl lake). The fresh water body can be a nice place to spent time in late afternoon or before evening watching the sunset.